Lemei Rock is located in the Indian Haven Wilderness of the Grifford Pinchot National Forest, and according to Native American stories, it serves as the literal leaping-off point of one legend. In it, an evil brave chased a beautiful woman to the peak of Lemei Rock. Trapped, the desperate woman looked down to see a lava flow far beneath. Rather than submit to the brave, she jumped to her death in the fiery lava. She landed feet first and then fell forward, burying her hands in the liquid rock. Her hand and footprints were permanently left in the rock as a testament to her sacrifice. Today, the results of the legendary sacrifice can be found in a unique interpretive display at the Trout Lake Ranger District Visitors’ center. 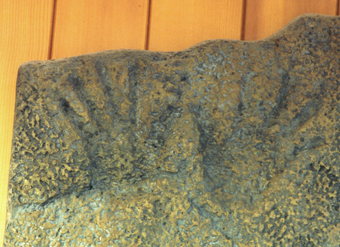 Mounted on the wall is a large plaster cast of a piece of rock that includes a set of hand and footprints. The cast was made from an imprint in the basalt rock that makes up the floor of Goose Lake. 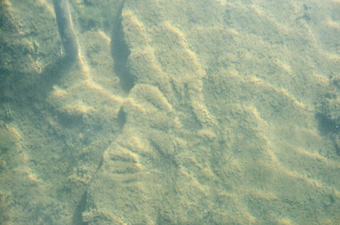 The real prints are hidden under the waters of the lake, but their origin is still debated. Some people believe, as in the legend, the prints were formed several thousand years ago when the site of the lake was a large lava flow. Pioneers noted the prints in the late 1800s, and over the years, geologists and engineers examined them. Some experts proclaimed the prints to be carvings. Others said they were real, insisting the handprints included fingerprints. Geologists say if the prints were real, they could range from 10,000 to 2,000 years old. If this were true, the person who made the prints may have even survived. In memory of this event, people would have returned to the site year after year, perhaps believing the imprints were supernatural. Like the Aztec and Inca, many Pacific Northwest natives studied the phases of the sun, moon and seasons. There are several locations in the northwest where native peoples celebrated the change of seasons, and Goose Lake may be where people waited for the sunrise of the summer solstice, the longest day of the year. Many years ago, someone may have knelt at the edge of Goose Lake during the winter solstice, since Native Americans only gathered there in the summer and fall. Looking east, the person would be able to see the sun rise over a high mountain, signaling the change in seasons. Perhaps over time that same individual returned to cut holes in the rock in the shape of handprints and footprints, showing others where to place themselves to experience the same thing. Goose Lake is a volcanic sinkhole, and in the ‘30s, the outlet at the bottom of the lake was dammed up. The imprints disappeared as the water level rose. In the 1990s, Larry King of the American Rock Art Research Association spent several days floating in a raft on the lake’s surface, scanning the floor of the lake through a metal tube with a glass bottom. He located the prints under several feet of water, then worked with Forest Service personnel to build a small coffer dam around them. After pumping out the water, they made a plaster cast of the prints. The dam was then removed and the prints were left to themselves once again, hidden under water and a covering of mud and grass. The plaster cast is the same one that now hangs on the wall of the Trout Lake Visitors’ center. 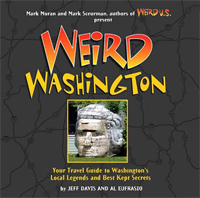 Weird Washington’s Jeff Davis has looked at the cast, which he says does not look like a carving. The footprints resemble either soft-soled shoes or moccasins, and both the footprints and handprints are over an inch deep into the rock. But he also did not see any great detail like fingerprints. Like many legends, you’ll have to go there and decide for yourself. Be sure to stop by Goose Lake, too, as, the ghost of a Native American woman sometimes appears on its shores, combing her long hair.